Things are yet again busy around here, and I haven’t posted for almost two weeks, so here is your catch-up post…. Last weekend, we had a great ending class to the Fish Lips Kiss Heel and by the end of class, everyone had a heel! 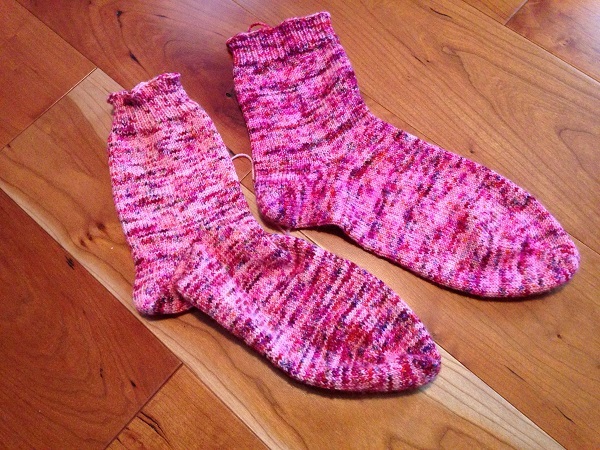 Then at home I finished my sock and now there is a pair! The one on the left is the second one, which had not been blocked yet. It looks as if the colors in the right sock bled a little when I blocked it because the color is definitely different. And they look like they aren’t the same size, but the one on the left will grow a little when it block it. I hope. To be honest, I forgot to write down the number of stitches I increased to in the toe of the first sock and when I did the second one, the first sock was on display in the shop so I couldn’t count them. 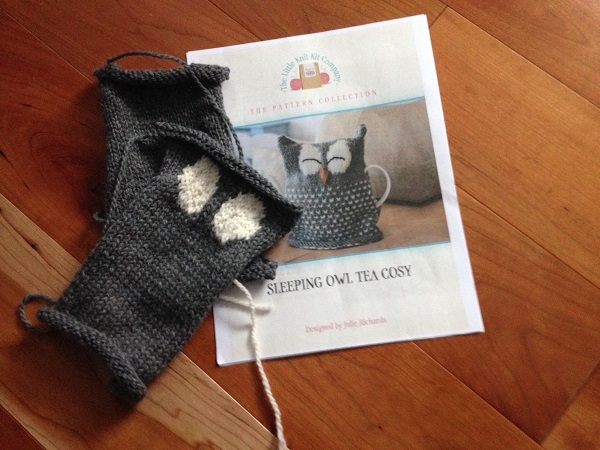 So hopefully I measured correctly on my template, and knitted with the same gauge. And for you eagle eyes, yes I will weave in those ends someday. I am making a modification to this. 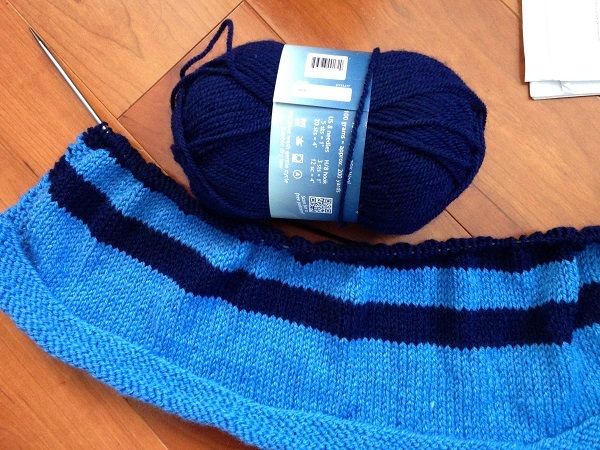 The pattern calls for flat two-color knitting which means two ends to weave in for every row with white stitches. See how many rows there are (that is on the front and the back)? Since I absolutely dislike weaving in ends, especially a lot of them, I decided to use this as an opportunity to practice and then teach duplicate stitches. This means putting in those white stitches after it’s knitted, on top of the gray stitches, and you can use one continuous strand of yarn. Stay tuned. Hopefully my modification works. And hopefully it will be a good class to teach! This is the #07 Striped Blanket from KnitSimple magazine. It is currently on hold though because I need to add gray next and that is on order. These were the Cocktails for Two knit-a-long socks that I started over two years ago (January 31, 2014). They were hard. At the hard parts I would put them down for a while to give my brain a rest. Then, when I picked them back up, it would take me 10 years to figure out where I was and how the heck to do it. So, I would put them down again. At some point, I went to try them on and realized I had totally picked the wrong size to knit and they were too small. So, I put them down again. I would look at them every so often and wonder if I should rip them out and start the size that would fit me. Because they really are cool looking. And I really love the yarn, Madelinetosh sock. Then I would decide to think about it later because the thought of doing all that really hard work again was daunting and not very appealing. 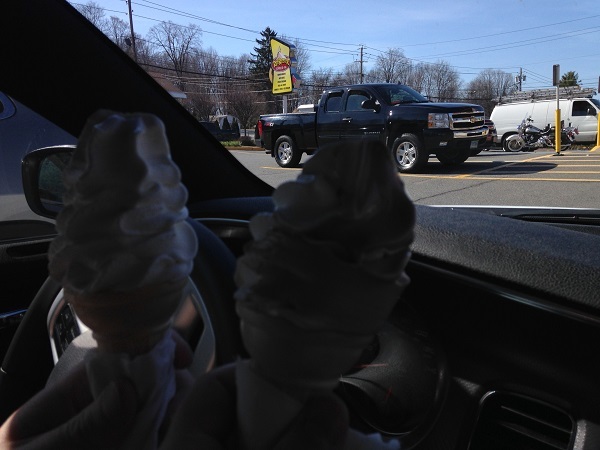 Well, the other day I thought about it again…. …. 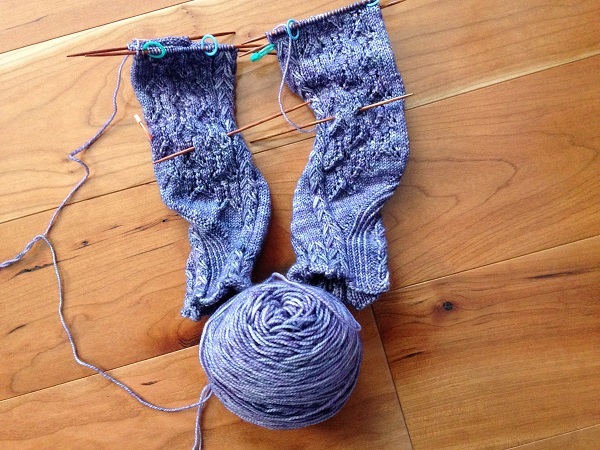 and I thought that there was no way I was going to knit that pattern again and I love the yarn so much so I will just make another, easier pair of socks with it. Someday. And now I am in a what-can-I-start-next-because-I-want-to-start-all-the-things-but-maybe-I-should-finish-some-things-first kind of mood. 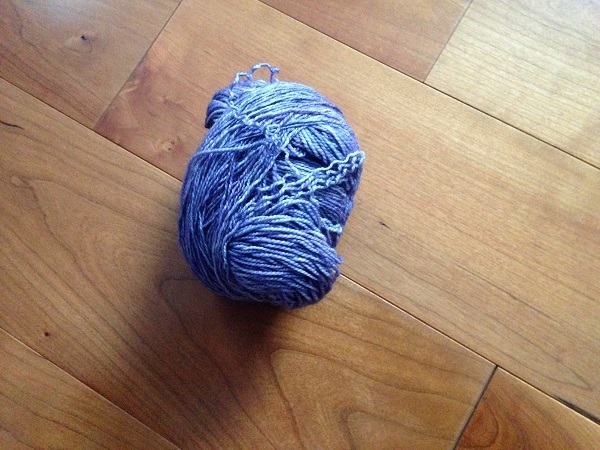 So I haven’t knitted anything for two days. Who can relate? Posted in Uncategorized and tagged buick club, cocktails for two, fish lips kiss heel, ice cream, red rooster, sleeping owl tea cozy, spring meeting, striped blanket on April 23, 2016 by lizytish. Liz, I can so relate to this! I have to be the queen of unfinished projects. I am enjoying your posts so much. Tell your husband I wish him a belated Happy Birthday! 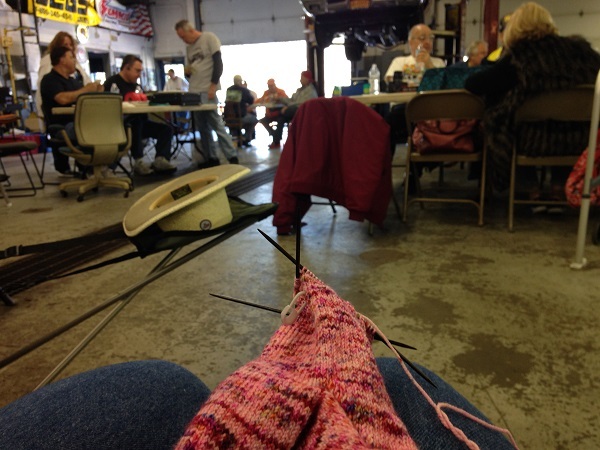 It’s so great that you can enjoy your knitting while you go with him to his car events. You are the perfect pair. And the library book sale!!!! I came home with a dozen or more books and hope that I can donate some back for next year. I’m glad you are enjoying them Ceil! 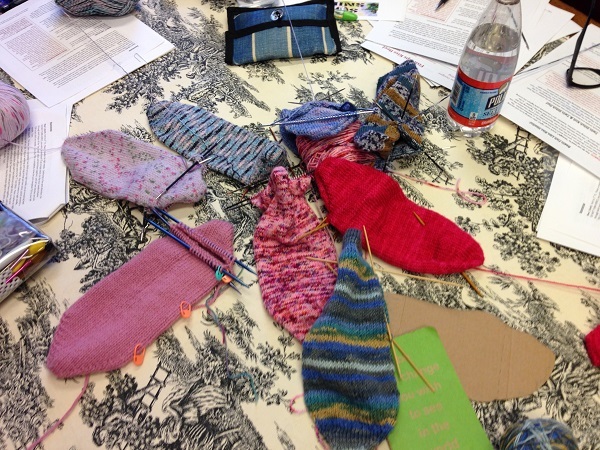 And the projects (yours and mine) will get done eventually — we just love the knitting so that’s the best part.